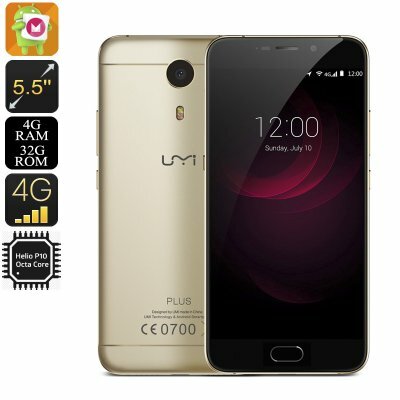 Successfully Added UMI Plus Android 6.0 Smartphone - Helio P10 CPU, 4GB RAM, 5.5 Inch IPS FHD Display, Dual SIM, 13MP Camera (Gold) to your Shopping Cart. The UMi Plus, revealed at the IFA2016 becomes the new flagship Smartphone. It features a familiar aluminum unibody design with 2.5D arched glass and boasts a 5.5-inch FHD IPS screen from SHARP for picture perfect displays. Underneath the premium seamless body is a Helio P10 processor, a massive 4GB of RAM as well as 32GB of internal storage, so top flight performances are a certainty with the powerful setup of the UMI Plus. Ensuring a long usage time the Plus has a 4000mAh battery for a whopping 20 hours of continuous talk time. What is more, because the phone has Quick charge technology, and makes use of USB Type-C port it can recharge in next to no time. As you'd expect from a flagship device, the UMI plus comes with two impressive cameras, the rear Samsung one can easily replace your standard camera and brings excellent photography capabilities to the phone as well as the ability to record video in full HD. Beneath the rear facing 13MP camera is a super fast fingerprint scanner that will read, verify and unlock the phone all in a fraction of a second -so the UMi Plus will keep all your data well protected and secure. 4G SIM support is possible on both the micros SD SIM slots that can run simultaneously to keep you connected to all your work and personal contacts from the one device. With a vanilla Android 6.0 operating system you can enjoy a hassle-free interaction with all the best Android features and plenty of options for games and apps. The UMI Plus Android 6.0 smartphone comes with a 12 months warranty, brought to you by the leader in electronic devices as well as wholesale Android Phones..